There’s something special about a reception in a wedding marquee. Perhaps it’s the feeling of being outdoors, indoors. Or the atmosphere generated by softly draped walls and ceiling. 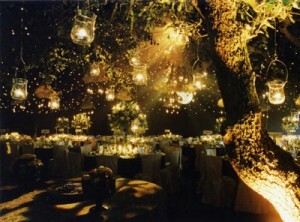 Perhaps it’s the fact that the bride can choose the whole décor to match and reflect her wedding colours. Or simply that the whole occasion is so different. Marquees are now so popular that you must book at least six months in advance to guarantee your chosen date. And don’t think they’re restricted to summer. Modern heating systems are so efficient they can keep a marquee as warm as any hotel room even on the coldest day – though in winter you may want to ensure you have a covered walkway from the house to the marquee. Once inside the marquee, ivory wall and ceiling linings can be teamed with coloured swags, curtains and overlays in your wedding colours, which are echoed in the table settings and even in the seat covers for your chairs. Ceiling lighting ranges from chandeliers to spotlights with dimmers and uplighters to create soft lighting along the walls. Or choose blackout linings with twinkle lights for a magical effect. Carpeted floors, dance floor, fully equipped bar – even a separate tent for your caterers and luxury washrooms – you’ll be amazed just how luxurious the whole effect can be.And a couple of tips:If you’re having a marquee at your home, make sure you can find enough parking spaces for your guests – and warn the neighbours about the extra noise and traffic. With its new state-of-the-art reinforced glass marquee nestling in the excusive Earl’s Garden, Mount Edgcumbe provided the perfect spot to combine the old with the new. 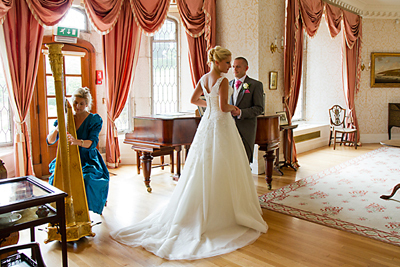 The house, on of the most beautiful venues in the south west, has over 500 years of history and stands in 865 acres of stunning landscape overlooking Plymouth Sound. It has three rooms licensed for civil ceremonies, plus the outdoor option of an elegant summer house and, for the reception, the historic Orangery sats up to 120 guests.